PLEASE READ THE ALERT BELOW BEFORE ORDERING. If your 126 sedan or SEC coupe is making front end clunking noises when you brake or go over bumps at slow speed you most likely need to replace the bushings where the lower front suspension guide rod attaches to a body subframe casting. The purpose of the support rod is to prevent the front suspension from moving aft under heavy braking. The purpose of the rubber bushing is to isolate vibration and road noise from the suspension attached to this rod. When the ball joint inside the bushing starts to wear out you will begin to hear that common clunking sound. If has seen this condition quite often on 126 chassis Mercedes, even on cars with less than 150,000 miles. These parts seem to be one of the first to wear on the front suspension of these cars. We only buy the best quality and fit check and inspect each one individually before we ship. FITS THE FOLLOWING: all 126 chassis sedans and coupes built from 1981 to 1991. Extreme measures we take to make sure these parts Work for you! Watch the video above as Kent explains how we check each one and modify it so you will not have any problem installing these parts. He feels sorry for owners to buy from vendors who don't double check the hardware this kit. The do-it-yourself mechanic can replace the bushings without removing the front suspension or front spring. THINK SAFETY. You will need a floor jack, jack stands, assorted hand tools, large hammer, and an inexpensive ratcheting hand cable winch or _come along._ You can check the condition of your bushings visually. Look under the car aft of the front tire and locate the point where the rod attaches to the subframe casting. If the rubber seal on the ball joint is cracked or broken, it is time to replace it. You can check them physically with the car in park. Grab a hold of the top of the tire and rock it fore and aft. If the wheel moves inside the fender well or if you hear clunking noises the bushing needs to be replaced. ALERT: You will receive the exact items shown in the picture above for both right and left front of the W126. The long bolt that is mentioned in Kent's instructions is no longer supplied with this kit. PLEASE DISREGARD THIS in the instructions. If your LONG bolts are rusty you can purchase them separately. See related products below: PDF picture instructions on how to install these yourself is included. Below is a picture of the long bolt NOT INCLUDED in this kit. Below is a picture of a loose ball joint inside the mount bushing. 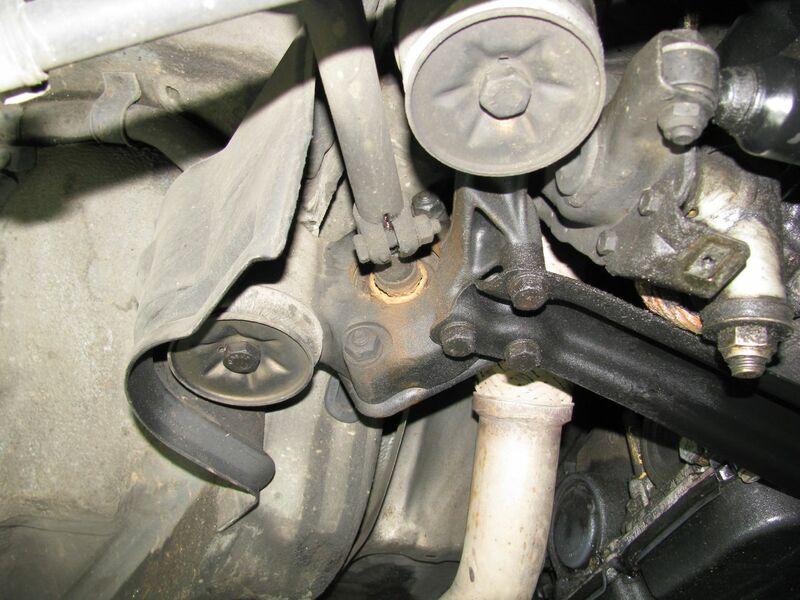 Broken ball joint rubber seals or rust around the joint are common signs the part needs replacement. Note rust area in picture. ALERT: Since W126 cars are now 25 + years old most of the rubber in the front suspension will need to be changed if you want the Mercedes "ride and feel." When replacing your guide rod mount bushings ( #13 in the picture below) you should also replace the two rubber bushings that hold the bracket to the subframe ( # 16 and #17 below. These are sold individually and separately. See related products below. Since you have to remove this bracket to replace the guide rod mount bushing this is the time to replace the other bushings! These bushings do not come with specific instructions, but Kent's instructions on replacing the guide rod mount bushings will at least show you how to get the bracket off. If you do not have the tools then you may need to take the bracket and the bushings ( #16 and #17) into a machine shop to have them replaced with a press.